Alys Beach is developing into the finest community on 30A. Erin Oden and Coastal Luxury specialize in the listing and sales of Alys Beach real estate. 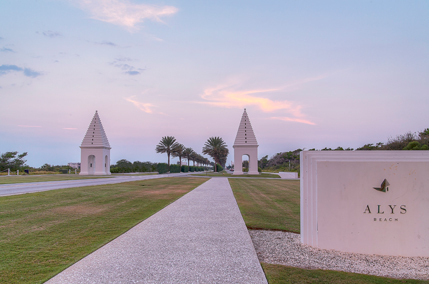 Alys Beach is the latest urbanist community along Scenic Highway 30A near Seacrest Beach and Rosemary Beach. Alys Beach currently consists of single-family homes and home sites, with condo units likely available as the community continues to grow. Alys Beach is approximately 2 miles east of Destin and 10 miles west of Panama City Beach in Northeast Florida. Built entirely to Fortified for Safer Living Standards, a national inspection-based program launched by the Institute for Business and Home Safety Alys Beach boasts this accomplishment as the the first community to be designed this way. Alys Beach incorporates a grace and elegance found nowhere else on 30A, following the town model pioneered by Seaside. Courtyard homes are build adjacent to one another on home sites with no lot line setback, while villas offer a more traditional setback and appear detached. Courtyard, villa and compound homes are beautiful yet simple and reminiscent of housing in Bermuda and Antigua. Pristine white masonry walls and stepped rooftops serve as accents to the colorful doors and trim that grace this area. Most have private patios with ponds and dipping pool, which are beautifully tucked away. The homes in Alys Beach are also practical and from the ground up were designed to incorporate resistance to hurricane force winds and wild fire. The magnificent Caliza Pool offers a breathtaking setting for fun and relaxation. This incredible limestone facility boasts a 100-foot elliptical infinity-edge saltwater pool, a 75-foot lap pool, a family pool, and a spa whirlpool. Chic metal bead drapery partitions secluded outdoor living areas. Private cabanas, elevated terraces and an open-air bar overlooking the Gulf of Mexico complete the truly unforgettable atmosphere. The Alys Beach Amphitheatre is located on the north side of Scenic Highway 30A. The 30,000 square-foot facility is an ideal venue for outdoor concerts and cultural events. Medjool Date Palms and sloping lush green grass frame the outdoor plaza. The Gulf Green is an area that should be explored and offers an impeccable view of the Gulf of Mexico. The park is equipped with separate restroom facilities and is also handicap-friendly. Caliza Restaurant and George’s have established themselves as staples of Alys Beach life offering simple to sophisticated fare. Alys Beach will soon include a Beach Club, Tennis Club and Town Center.